"Las Esquinas" (58"x72", 2007) was inspired by tile patterns that Kris documented in San Miguel de Allende, in the central mountains of Mexico. The butterfly-and-flower border honors Kris's visit to the nearby Monarch Butterfly Biosphere Reserve and the abundant calla lilies blooming throughout the region. EDITOR'S NOTE: "Making Peace with Snow," our cover image for the Gallery Walk guide this month, is currently showing at American Traders, 257 Marlboro Rd., West Brattleboro, along with work in a variety of mediums by several other members of Brattleboro-West Arts. 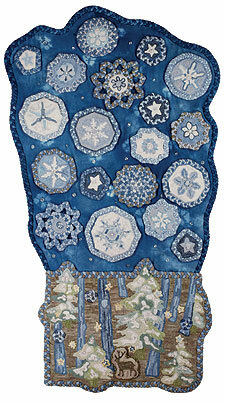 Stop in from 10 to 5:30 weekdays for a close-up view of this stunning tribute to winter's beauty. See many other examples of Krisís unique work at www.KrisMcDermetRugs.com. "Traditional braiding and hooking have been an important part of my life for 30 years. 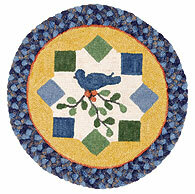 I love the combinations that can be created by joining both braiding and hooking in a single floor rug or wall hanging. "I use 100% wool fabric in time-honored ways: braiding and hooking are skilled arts that have been practiced since the 1800s. I then combine the braided sections and the hooked sections in new and untraditional ways. I aim to strengthen the delicacy of the hooking with the boldness of the braiding, sometimes creating a traditional rectangular piece to be used on the floor, but often making a more freeform shape ideal for hanging on the wall. "I mix traditional wool and silk dyes to achieve the rich, subtle colors that visually marry together the various elements. I also use the negative spaces between the elements, where the floor or wall might be visible, to help bind the finished piece together. 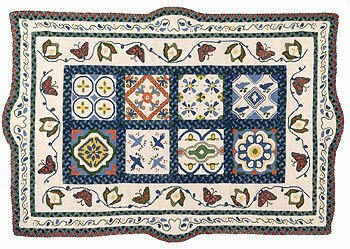 ìHopscotchî (29îx34î, 2007) was designed for a class on geometrics and was featured on the Spring í09 cover of Rug Hooking magazine. 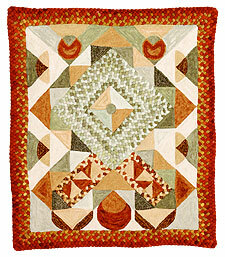 "My hooked designs are inspired by nature, family stories, and books. Those ideas become patterns that I transfer to a linen backing prior to beginning hooking. 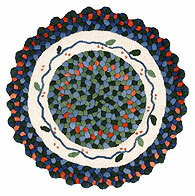 The braiding might be at the center, at the border, or in between elements of the finished design." Kris is an Occupational Therapist with the VNA/H, and her other passions include gardening, baking, music, and being part of the Brattleboro community. She lives with her husband Stewart, dogs, cats, and fish high up Sunset Lake Road. Her sewing room, the center of her creative space, is filled with bolts, rolls, strips, and braids of soft, multicolored wool. From her own website, Kris adds: "The colors, designs, and textures of the wool complement both mediums [of braiding and hooking]. So much beautiful wool is available, whether woven, dyed, or overdyed, and the possibilities are endless. "One to two rows of braiding can frame a hooked piece nicely, or switching back and forth between hooking and braiding several times in the same rug -- and even leaving "holes" -- adds interest and texture. The hooking is padded to be the same thickness as the braiding and will last for many years on the floor or wall."